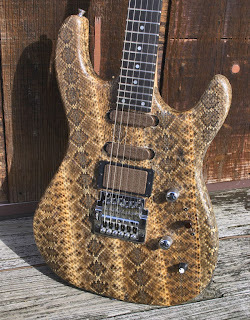 You're looking at genuine western diamondback rattlesnake skin! Even the headstock has the stuff, though fortunately the fangs were left off. I found this site via the Music Thing blog. But you ain't seen nuthin' folks! This guy builds beautiful cabinets for amplifiers and effects. The site includes gorgeous photos of exotic wood cabinets and effects boxes encased in dovetailed exotic woods. Other effects units and cabs are finished in tweed and rattlesnake skin.